Active projects of which I am the primary author, presentations, and papers are on the menu. Historical accounts requested from me are posted below on this page. The layout isn't very nice, but it's fairly functional. I know several people depend on things posted below for some oddball usage. If I get more time I would like to write some new papers and articles. I might even drag some of my old BotShop articles and papers over here. Try the Java SRP Viewer to see 3d models of some SRP routes. William van der Sterren and I had a good time doing the SABIN AI. We called the methods of routing the SABIN bots the Shiva Routing Protocol, since I name all my large projects after a goddess. William van der Sterren and I worked out the routing and goal evaluation for the bots over a short period of time. After the design and algorithms testing was worked out, I started focusing on the data models and tactical intelligence, while William worked on things like terrian assessment and planning. This project has ended. William continued working off the base bot and built a highly developed cooperative AI. His fire squads are very lethal, as they have cooperative tactial intelligence among team memebers. The bots can also work with human players. NOTE: This is here only for historical purposes. It's been years since this visual display was made for a presentation. It also shows how java has changed over the years. I had to make my own buttons because browsers only supported java 1.0 at the time. Ah memories. Download source from my MindSpring mirror. Download source from my UWG mirror. Mtk is a small GPL GUI tool kit for GGI. Currently only X will give you full use of the toolkit, however I'm working on fb and svga support. I will have coding guidelines and API docs based here as the project rolls out. 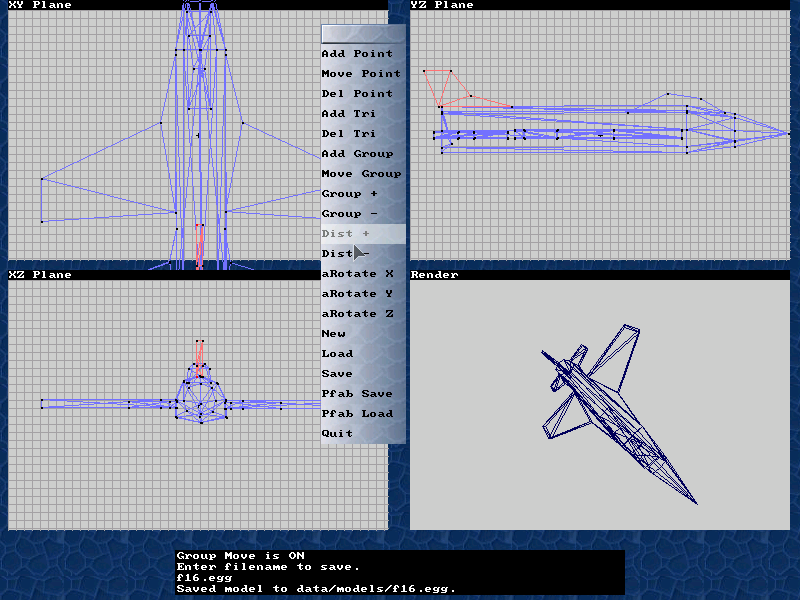 My 3d modeler is included with the source as a demo. I can't post the tarot card reader I made with mtk, as it would infringe on copyrighted material. If you have a tarot deck and would like to give me permission to use it in mtarot, email me. Mtk may get a direct OpenGL target one day. NOTE: This is here only for historical purposes. Mtk is no longer actively developed, since I'm now working on a GL windowing toolkit. The 3d modeler prototype got spun off into a new project called GooseEgg. You can visit the new project here. GGI became less important after the release of SDL from lokigames. This project was a good learning experence about designing a user interface. Download 0.0.8-2003.02.28 source from icculus.org mirror. Libferit is a GPLed library for transferring files via http, ftp, gopher, proxy server, and the beginings of gnutella support. This library was orignally based on the ftp/http/gopher client snarf 2.0.9's netcode (1998), since I didn't know the protocols and I just wanted to make a GPLed web spider without reading the RFCs. It's rarely updated these days. Using this library you can easily make simple network agents in clean, Object-Oriented C++ code. The sample client can be used with shell scripting to do complex file transfers in a batch mode or with user interaction. When reporting bugs send a --verbose output, stack trace, and version number. Order of Lords is a game I work on from time to time. It's desgined to be a civ/large scale combat simulation. Currently it combines fantasy elements must like Masters of Magic. It's not in a playable state as yet, since I'm still fiddling with the design and the game engine. The latest version runs on mtk, not OpenGL. The 2d mapping and unit mapping is finished, and I also made a map editor. I don't know when I'll start back on this, since I'm a member of QuakeForge and working on the Quake engine with my freetime for game programming. NOTE: This is here only for historical purposes. Order of Lords is no longer actively developed... FreeCIV pretty much did what the base of the project was about aside from the RPG, magic, and climate aspects. I also got bored of civ games and started working on FPS type games like OpenRaider, which is a reimplmentation of the TombRaider 1-4 engines with OpenAL 3d sound and OpenGL renderer. Download DBQ2 source from my MindSpring mirror. Download DBQ2 source from my UWG mirror. This will let you use Quake2 player models in my Quake DarkBOT mod. DarkBOT is like clan arena with bots, and is the first bot I wrote for Quake. To compile this source you need the QCC compiler. You need MDDC to convert model formats. Download mddc source from my MindSpring mirror. Download mddc source from my UWG mirror. This will let you convert Quake2 MD2 models into Quake MDL format. Please read the README, before using. As of this writing there is a bug in texture alignement. Adds edge flipping to metacity window manager. ( Drag windows between desktops. ) 001_metacity-mongoose-edge-flipping.patch. Debian XEmacs-21-gnome-nomule 'patch' for tab buffer using a k-rad gnome dock. glyphs-gtk.c. screenshot. I currently use Gtk+ GNU Emacs, so this is unmaintained at the time of this writing.